Crown Publishing Group (NY), 9780307720894, 375pp. Combining the stories of the real hero and his Disney-enhanced afterlife, Born on a Mountaintop delves deep into our love for an American icon. Pioneer. Congressman. Martyr of the Alamo. King of the Wild Frontier. As with all great legends, Davy Crockett's has been retold many times. Over the years, he has been repeatedly reinvented by historians and popular storytellers. In fact, one could argue that there are three distinct Crocketts: the real David as he was before he became famous; the celebrity politician whose backwoods image Crockett himself created, then lost control of; and the mythic Davy we know today. In the road-trip tradition of Sarah Vowell and Tony Horwitz, Bob Thompson follows Crockett's footsteps from the Tennessee river valley where he was born, to Washington, where he served three terms in Congress, and on to Texas and the gates of the Alamo, seeking out those who know, love and are still willing to fight over Davy's life and legacy. Born on a Mountaintop will be more than just a bold new biography of one of the great American heroes. Thompson's rich mix of scholarship, reportage, humor, and exploration of modern Crockett landscapes will bring Davy Crockett's impact on the American imagination vividly to life. BOB THOMPSON was a long-time feature writer for "The Washington Post" and the editor of its Sunday magazine. During his years at "Post," he was known for his pieces on the intersection of American history and myth. "Bob Thompson blazes the dangerous trail between myth and history with the skill of a fine scholar and the wit of a born storyteller. 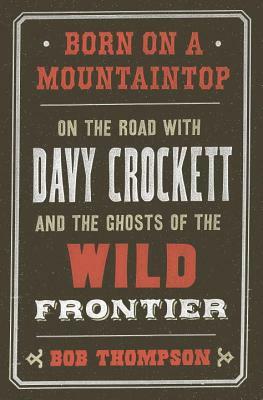 I never realized the search for Davy Crockett, real and imagined, could be so enlightening and so much fun."